look at some new ideas. This was an editorial article discussing new ideas for testing shoulder strength and max ranges of motion. The data collected and referenced is a small sample size of athletes that they testing strength on. 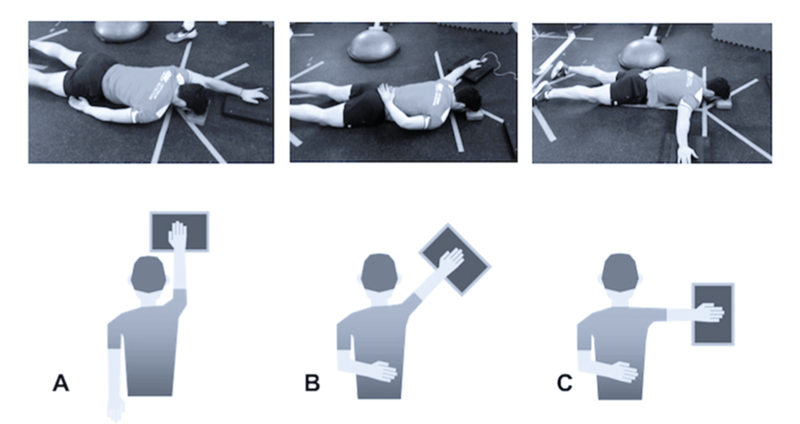 Researchers tested force production with a plyometric push up as well as isometric contraction at end ranges of motion in flexion, scaption and abduction. So far the testers are finding the the PPU and ASH test are reliable. Finding reliability means that the test is getting consistent results in finding differences in strength in affected sides vs. non-affected sides. In specific cases the ASH test and PPU test have proven very beneficial in determining if an athlete is ready to return to full participation. This is a unique way in looking at shoulder strength and how it is applied not only plyometrically but at end ranges of motion. Utilizing this information can help determine if an athlete with an injured shoulder is completely ready to return. Testing at end ranges of motion isn't something that we normally incorporate into the functional testing to determine return. Often shoulder injuries occur at the extreme end ranges of motion and without having strength and stability. Utilizing both a plyometric test and strength at the end ranges can help bring more evidence to ensure safety. The authors reference this during the article but this testing is just at the beginning. They do mention the test being reliable which is great but more testing and outcome measures will be needed in order to make it a potential 'standard' in shoulder testing. Ashworth, B. Force awakens: a new hope for athletic shoulder testing. Br J Sports Med, 0:0.